You can use Living Record as your own personal records system to keep track of the wildlife that you see. Records are linked to location markers that you add to Google Maps. 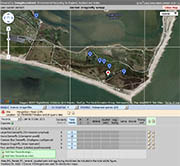 Click on a marker to review the records for a location. It is also easy to review your records for a single species or for a specific date. Your records are treated as personal to you. Other users do not see the details of your records, apart from the experts who are responsible for verifying records before they are passed on to local record centres. There is a growing list of subjects that you can record, from mammals to moths, amphibians to wasps, even vascular plants.